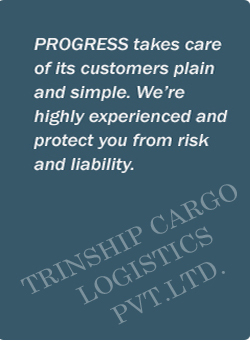 ﻿ Trinship Cargo Logistics Pvt.Ltd. Couriers are basically a service for sending money or goods at some extra cost. It involves a person or a company engaged in transporting, dispatching and distributing letters, parcels and mails. In a rather layman term, it can be said that, compared to normal mail service, a courier possess many added features. A courier is much faster, safer and secured than ordinary mail. It is a specialized service with authenticated signatures. It has tracking service with each service being treated as a specific individual case. Dedicated timely deliverance is its primary hallmark. These features do cost a bit extra but with so many features available, the cost gets leveraged. The Professional Couriers has grown and placed itself as an ultimate service provider in the Courier Industry in India with its assurance of many years expertise. We have already registered our presence with our exclusive and largest network in the courier and express industry in India. We have created bonds among all around us and with the company by valuing the one-to-one relationship. We aim at doing things differently to create a revolution in the customer service to keep all of us smiling with satisfaction. Trinship Cargo Logistics Pvt.Ltd delivers highly flexible sea freight services through partnerships with leading carriers and tailor-made rates. With many years of experience in the industry, we have built solid cooperation with our partners. Based on our volume we are able to leverage very good rates from various shipping lines for Cargo. We have Contract with various carriers for major sector. Being a Multi model Transport Organization ,Factory stuffing.Multi Model Transport Organization, we can handle shipments on our own House Bill of Landing, thus ensuring good handling at both origin and destination Port. Trinship Cargo Logistics offer a comprehensive range of sea freight services designed to save you both time and money with door to door control of your shipments India. Our experienced team specialists can advice you on the available option to move your cargo by sea. We provide creative and cost-effective logistics and solution for different requirements of our clients. Utilizing our vast experience in material handling distribution, freight forwarding ,logistics and supply chain execution. We can help our client in increasing efficiency and save time and money.Turn your cargo and inventory handling costs into a competitive advantage. Let Trinship Cargo Logistics help to analyse your supply chain. We organize, track and manage materials flow by providing a premium service to those who require comprehensive supply chain solutions. We operate an Express Courier Door to door service around the country. We employ only the best people in the industry and use leading edge technologies to ensure the secure delivery of your packages, today, everyday, on time, every time and right time. We also offer an International on board courier service at very competitive prices. To provide international services company have tie-ups with the renewed courier companies to provide better service at cheap rates.